Everyone has their own shopping hacks when it comes to finding the best pieces on ASOS because let's be honest: It's physically impossible to trawl through thousands of products (the current "new-in" total sits at 3084 items) without going a little insane. It's all about clever search terms, quick shortcuts and knowing where to find the best edits. One of our favourite ways to cherry-pick the coolest items is finding the niche brands that are sometimes lost amongst the fashion heavyweights. Once you've identified your faves, you're left with a much tighter edit of stylish pieces, and suddenly the site feels more like a small fashion boutique from which to discover hidden gems (and which has a super-easy returns policy). Win-win. But how do you find these brands? We hear your cry. Well, that's where we come in. We harnessed our extensive shopping knowledge and came up with a shortlist of the brands we've recently found on the site. 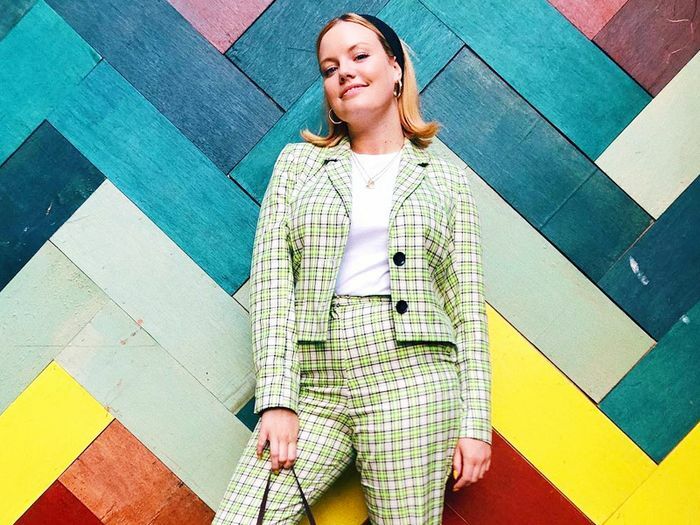 Hopefully, our edit will help you discover those lesser-trodden corners of ASOS and nab the pieces that no one else knows about. From Gestuz's Scandi staples to DL1961's really fantastic denim, we have a feeling you're going to love what we've found. Scroll down to see and shop our picks. Hanna Stefansson styles her Gestuz leather trousers with tonal pieces, including a checked blazer and camel-coloured scarf. Now this is how you do sequins in the daytime. Sara Brown makes it look so easy with a statement knit and ankle boots. Sister Jane's pink striped suit looks impossibly cool with a pair of platforms and a slogan tee. Good work Megan. Scroll down to shop our edit of the best secret brands on ASOS. This is your one-stop-shop for Scandi style. Right now, we're loving its cosy knits and event-ready dresses. Offering vintage-inspired pieces, Sister Jane is great for personality packed dresses, quirky shirts and statement suits. Plus, it's pretty affordable. It might have a small edit on the ASOS site, but that doesn't make it any less impactful. We're obsessed with Clio Peppiatt's '90s style snakeskin jacket, which would look so good with dark denim. Its Western-style shirts are at the top of our new season wish list, too. If you're looking for a good quality pair of jeans from a lesser-known label, look no further than DL1961. Its range of flattering and fashionable styles might come in at a higher price point, but it's an investment worth making. OneOn is one of our most recent discoveries on ASOS. Delivering a range of both statement and timeless styles, the moment we saw its chunky lilac knit, we were sold. The best bit? All of its designs are hand-knitted. We were tipped off about Neon Rose at an event recently, specifically for its chic selection of maxi dresses and statement jackets. The brand also offers a stylish line of plus-sized pieces, so everyone can get in on the action.